With roasted corn, over-the-top carnival threads, and every flag from the Caribbean imaginable, this past Monday New York celebrated the 46th West Indian American Day Parade in Brooklyn. 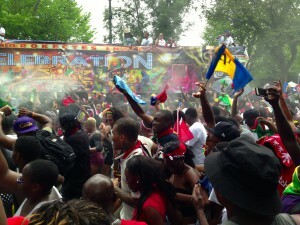 Here is a glimpse of the scene as flags waved high to show Caribbean pride. Even a short stint of rain couldn’t stop these parade-goers.